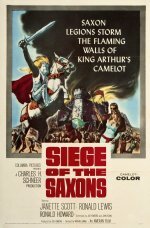 Second-rate British thespians clank around in chain mail while women blush demurely in this Arthurian tosh that was made for peanuts. The sword Excalibur is still the weapon of choice, sought after by outlaw hero Ronald Lewis, the wooden Mark Dignam as King Arthur himself, and Jerome Willis as a villain with a dodgy leg. Chief damsel, in a flowing nightie, is Janette Scott, the daughter of Thora Hird and a leading British starlet of the day. If modern audiences hadn't been spoilt by parodies such as Monty Python and the Holy Grail, this cheesy plod might have seemed rather amusing; instead, it's just several knights short of a round table. Period adventure starring Ronald Lewis and Janette Scott. King Arthur is recovering from an illness at Edmund of Cornwall's castle. But, unknown to the king, Edmund is in league with the Saxons who are plotting to seize power.